Investing in one’s business takes time, money and most importantly, effort! It’s that time of the year when we sit down with pen and paper and write down the many ways we could invest in our business in 2010. I firmly believe we are each responsible for our own business success. You need to take ACTION too and INVEST in YOU! Now print these out and pin to your office wall so you can visually see it every day. And most importantly DO IT! I’ve been a senior administrative assistant for over 25 years. Although I still love what I do in the corporate world, I decided to see what else was out there that would offer me the same fulfillment, with more flexible hours. One day I researched “virtual assistant” and was amazed at the amount of information out there. In 2008 I decided to put my skills to use and open my own VA business. I had no clue how to start a business. I joined VAnetworking and started to read through the forums. 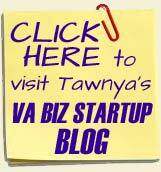 I had no idea starting a virtual assistant business could be so difficult. I felt I was going in all different directions. I had so many questions, ranging from what my start-up costs would be, to what types of equipment I would need to invest in. Business plan?? I had no idea where to begin. After spinning my wheels for more than a month, I invested in the VBSS. The VBSS helped me to stay focused on a task through completion. I joined the VAinsider Club, and really enjoy networking with established and new VA’s. I learn something new every day. One of the benefits of being a VAinsider is the seminars. I try to attend the seminars whenever my schedule allows. If I can’t attend, I try to listen to the recordings afterward. Another great feature of being a VAinsider Club member is access to the eBooks. I have read some of the eBooks, but still have much more to read and learn. After my site was up and running, I started networking on LinkedIn and Twitter. Networking is not always easy. Due to my busy schedule and the fact that I still work full time, I can’t attend daytime networking events. I eventually found some evening networking events to attend. After networking on LinkedIn, Twitter, and attending networking events, I still didn’t have any clients. I then decided to take a course through VA Training. Taking this course assisted me in creating a business and marketing plan. It also helped me determine what my vision and goals are, as well as how to target my ideal market. Social media has changed the way businesses communicate. I am currently taking the Social Media marketing on-line course through VAClassroom to learn new skills that I can offer to small-business marketers. 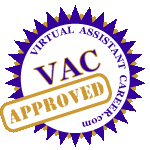 Through VAClassroom I received training and became certified as an internet marketing virtual assistant. I have learned so much from these courses. I am planning on taking their new course, ‘Virtual Event Specialist’. Craig is an excellent instructor. I like that I can go back and review the videos for a refresher anytime. 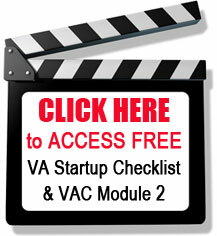 Just recently I received my VA certification from VAcertified.com. I am so proud to display their logo. This certification adds credibility to our industry and it shows the world that I am who I say I am. My web site is in WordPress. I am currently taking an on-line course “How to Build Your Own Web Site” by Tim Fahndrich. This course is providing me with a good base on how to maintain my site, and giving me confidence to add features without the fear of doing something that might crash my site. In order to succeed in business you need to stay on top of all of the latest trends. Continuing education is a key factor in this success. So that I can continue to learn and grow my business, I will be attending my first on-line summit on November 6th. I am anxiously waiting to hear all of the great speakers lined up for the 4th Annual IVAA On-line Summit. Earlier this year I had my thyroid removed and diagnosed with thyroid cancer. I had to stop my medication and follow a low-iodine diet for three-weeks. I was so tired all the time that I couldn’t focus on my business, and I even gained unwanted weight. Right now I am happy to report that I am cancer free and my energy levels are back up where they should be. I am back to networking and even created my Facebook business page. I have started working out again and can now focus on my business. Not only is education a crucial part of being successful in business; remaining healthy is also essential. Exercise, eat right, and listen to your body. How are you investing in your business in 2010? Add your comments below and let us know what you are doing this coming year to invest in your business!